The Tarxien Temple archaeological complex is a UNESCO World Heritage Site and is one of the oldest temples in the Maltese Islands, dating back approximately to 3600BC. Following the discovery of the Tarxien Hypogeum in 1913 situated only 400 metres away, it was only natural for a particular farmer in the same area to feel curious after constantly striking large boulders while ploughing his fields only a year later. He therefore contacted the director of the National Museum, who started to work on the first dig of the site, and the centre of the temple compound was discovered. 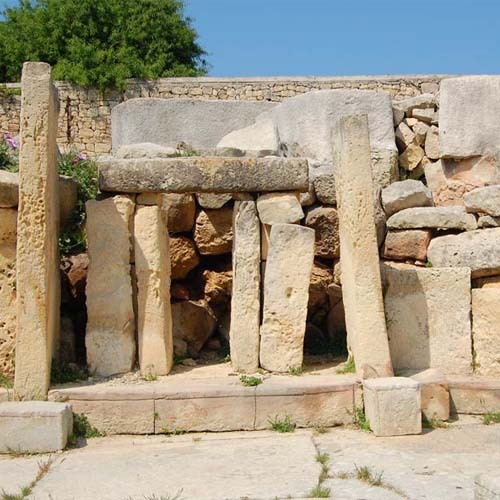 The Tarxien Temples consist of a complex of four different megalithic structures built between 3600 and 2500 BC. The oldest of the structures is located at the easternmost end of the site and is smaller than the others. Nearby, also facing the eastern side, is another temple with well-cut slab walls and ‘oracle-holes’. The temple on the southern side, which is the second oldest within the complex, is the one with the most extensive decorations, sporting relief art and spiral patterns as well as the lower part of the colossal statue of a skirted figure which surely portrayed what is known as ‘The Maltese Fat Lady’, the goddess of fertility worshipped in Neolithic times. What is known as the Central Temple, which was probably the last to be built, was constructed with a unique six-apse plan and contains evidence of arched roofing. The main altar is decorate with spiral designs and it is where animals were sacrificed to the goddess of fertility, as proven by the remains of animal horns and bones, as well as a flint knife, found underneath the alter by archaeologists. A flat slab embossed with animal drawings was also found. The discovery of the temple complex at Tarxien did much to solidify Malta’s national identity as well as its historical and cultural heritage. In 2012, an elevated walkway was constructed with the scope of facilitating those visitors who wanted to admire this pre-historic site. In 2015, in a bid to preserve the stones of the temple from being further eroded due to the onset of time and inclement weather, a protective tent arching over the complex was completed, and the visitor’s centre was also refurbished.